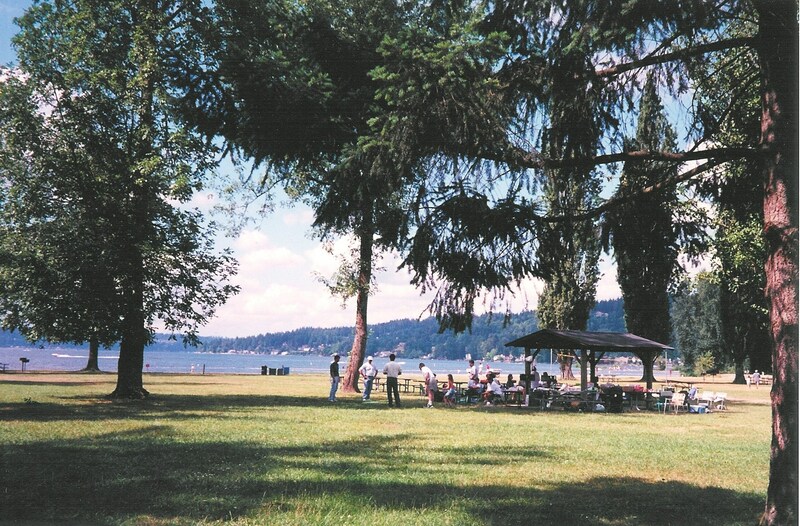 Lake Sammamish State Park, circa 2001 (IHM 2002-27-1). Lake Sammamish State Park is a 512-acre day-use park with 6,858 feet of waterfront on Lake Sammamish. The area around the lake was an important culture zone for local Indian tribes for centuries. The park provides deciduous forest and wetland vegetation for the enjoyment of visitors. A salmon-bearing creek and a great-blue-heron rookery are additional features. The Anderson farm belonged to John Anderson, a Norwegian immigrant, and his wife Addie. Addie Anderson was first married to a man named John Smart, and her children from this marriage also lived on the farm. There were three girls named Florence, Nellie, and Carrie, and a boy named Lawrence. 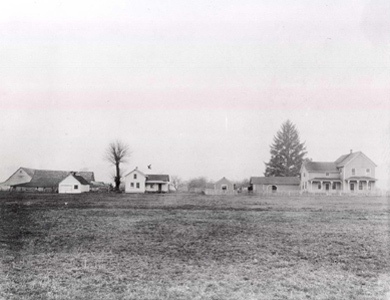 The Andersons built what became known as “the big house” on the property in 1890. The big house had two stories and a total of ten rooms. Another house consisting of six rooms was built there sometime before 1895; the farm foreman and his family lived there. Other outbuildings included a horse barn, a small milk house, two garages, a fruit shed, and a log cabin with a plank floor. In 1916, Lawrence and his wife, Lulu, returned to the farm with their children Nelliemae and Raymond, and lived there for several years. 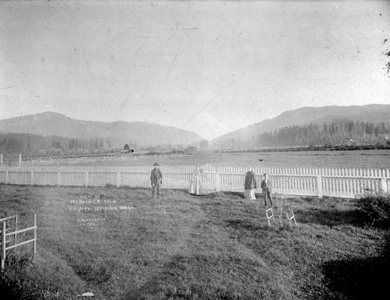 The other track of former farmland that makes up Lake Sammamish State Park was known as the Jensen farm. 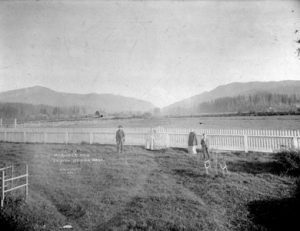 Albert F. Giese originally owned this tract, which was bisected by the Monohon or Redmond Road (today’s East Lake Sammamish Parkway). Giese built a house on the property in 1898. In 1905, he also constructed a barn complete with indoor plumbing for the cows. County assessors noted that the barn had 18 metal stanchions, and nine water outlets, indicating that Giese’s cows stood head to head with a shared water faucet for each pair. Jensen acquired the property in 1942, complete with house and well-plumbed barn. According to his friend Bill Bergsma, Sr., Jensen always had a herd of 60 excellent Holstein cows. Even though the land would not become a formal recreational area until 1953, it had always been popular with residents looking for a place to swim or fish. Photographs from 1913 show most of the residents off High Point standing on the banks of the lake at the High Point Sunday school picnic. Both Tibbits and Issaquah Creek flow through the park and into the lake. Fishing at the mouth of either creek could net a fisherman trout, salmon, bass or perch. Hans Jensen continued the practice of opening his beachfront property to local residents. Before his death, Jensen also specified in his will that the land be donated to the state for the use of the area’s young people. His land became the property of the Washington State Parks Commission in May of 1958.Giese’s original house still stands; just behind it lies the Hans Jensen youth camp. The property once owned by the Jensen and Anderson families has a long tradition of providing recreation to the residents of Issaquah. The park not only continues this tradition, but also shares the area with visitors from all over the state.